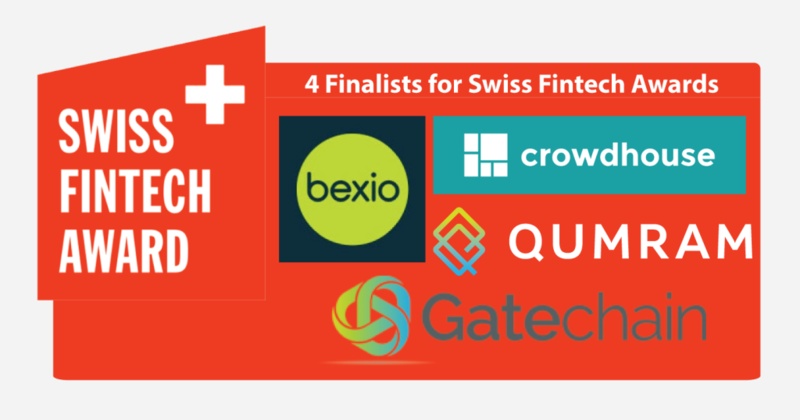 The Swiss Fintech Awards jury has announced the four finalists for its annual ceremony rewarding the top Swiss fintech startups in three categories: Early Stage Startup of the Year, Growth Stage Startup of the Year and Fintech Influencer of the Year. Crowdhouse, an investment platform, which allows users to invest directly and conveniently in Swiss real estate. Investors earn revenue from rental income which are distributed quarterly. More over, all investors participate directly in the value development. Gatechain, a tech startup which develops solutions for trade finance. Gatechain has created a decentralized network that leverages blockchain technology to connect all participants in the trade ecosystem, allowing to reduce processing time and costs while improving cash-flow in trade. Crowdhouse and Gatechain competed against AAAccell, a company that develops software and solutions for the financial services industry, and Inpher, a cybersecurity company. Bexio, a provider of cloud-based business and accounting software for small enterprises. Bexio provides a platform that connects accounting firms, banks, lenders and other key suppliers to small businesses. It serves over 8,000 companies with 600 new businesses joining the platform each month. Qumram, a startup providing a solution for financial services organizations to ensure regulatory compliance, detect fraud and improve customer experience. The company provides a fully-compliant and transparent digital audit trail of all online, mobile and social interactions. Other semi-finalists in the growth stage category included Advanon, an online platform for SMEs looking for short-term financing, Arviem, a supply chain company offering real-time end-to-end cargo monitoring services, Fundbase, a solution for sophisticated hedge fund investing, and Lykke, a company building a global marketplace powered by blockchain technology. The Fintech Influencer of the Year award will reward the most outstanding personality or organization that has contributed to the advancement of the Swiss fintech ecosystem. The candidates will be nominated by the jury members. All the finalists will be presenting at the Finanz und Wirtschaft Forum Fintech 2017 – Drivers of Change on March 9, 2017 at the Dolder Grand in Zurich. The winners of the three categories will be named during the official Swiss Fintech Awards Night later that day, and will selected by a jury comprised of representatives from leading firms and organizations including the Institute for Financial Services Zug IFZ Lucerne University of Applied Sciences and Arts HSLU, Credit Suisse, Fusion Accelerator, SIX, UBS, MIT Sloan School of Management, Accenture, Level39 and more. The Fintech 2017 – Drivers of Change conference in March will cover emerging trends in fintech including API banking and regtech, and will discuss how Swiss banks and insurers can prepare for the future. Speakers will include Ivo Furrer, CEO of Swiss Life Switzerland, Hansruedi Köng, CEO of PostFinance AG, and Emmanuel Mogenet, head of machine learning at Google Switzerland, among others. In collaboration with the Berlin-based start-up XAIN, Porsche is currently testing blockchain applications directly in vehicles. This is not the first instance of a luxury automotive company turning to blockchain The post Porsche Explores Blockchain Deployment for Driverless Cars appeared first on Fintech Schweiz Digital Finance News - FintechNewsCH.